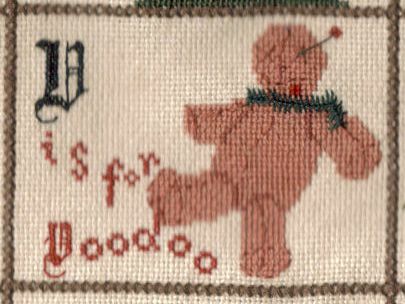 Serendipitous Stitching: Do You Do Voodoo Too? I'm so proud to be the blame-taker/ inspiration for your latest project. I'm glad I threw away that particular comment. I'm looking forward to seeing some of the stitches as they go in. Tee hee hee! Awww, your little voodoo doll looks great! Wow - you have so many cool projects going on. I am really impressed with the alphabet and you did a fabulous job on the small letters - they really look a part of the piece! I love the voodoo block! That says something about me, doesn't it? Love the voodoo block! And great WIPs - you were very clever with the added lettering. The birth sampler is looking great. Cherry Tree Hill is growing nicely too. The voodoo doll is actually creeping me out. But you did a great job on it! Can't wait to see Wyvern! Ah Ha!!! Using my hubby's comp let's me comment!!Whoohoo!! Great job on the voodoo doll! I will have to take a peek at the Easter Egg hunt post and see what the answer is! Great stitching on everything. I do like the voodoo doll - I am still amazed that you're doing it over-1! Cherry Hill is turning out very nicely, I like the idea of different thread counts in one project. 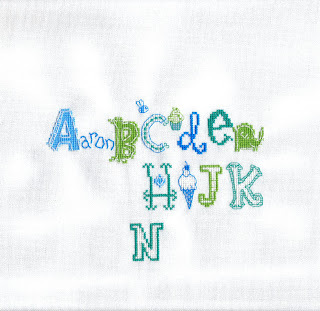 Very cute idea for the baby sampler and you did a great job charting out the lower case letters. Oh, now I have the David Bowie's voodoo-baby-magic-dance song in my head! I love this piece, it's looking great! The name sampler is really cool too! Love the wonky letters! Great job. Great WIPs. This alphabet looks really great - what an idea to have voodoo for the letter V. Never seen before. 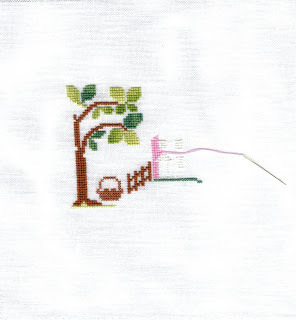 Great progress and finishes on all your stitching. Oh, I love the Voodoo that you do - great stitchy progress.